August 1st is the opener for the famed Buoy 10 fishery and we are expecting a great return once again. With upwards of a million salmon returning August will prove to be exceptional. We all want to catch fish when down there. I’m going to share a few tips to hopefully make your trip a successful one. I believe the best bite is during the flood tide. During this tide I like to start low on the river as the tide starts to come in. The lowest part we can fish is buoy number 10. At low slack I want to be down low and as the flood tide comes in I’m following the tide upriver. To dive deeper: when fishing the Oregon side I like to start low and follow the tide up as the fish come in. We hold against the current rather than moving upriver with it. During this time fishing suspended baits is best. Normally, I’ll run them 22-45 feet down. If I hook fish, I will stay on them until I don’t get bites for a while. When the bite slows I’ll power upriver, turn and drop lines. Normally, I’ll start fishing again at the 14 or 20 buoy and motor towards the 22 buoy. The fish are moving fairly quick. Essentially we’re staying ahead of the fish. I’m not trolling from buoy to buoy I’m running upriver and dropping line. I generally focus on the 10 buoy area early in season. I start here at low slack and intercept the incoming fish. However, for last two hours of the flood I’ll generally migrate to the Astoria Meglar Bridge and troll upstream with the tide. On the outgoing I focus above the bridge, normally on the Washington side. Having a variety of bait aids in attaining strikes. I keep fresh and frozen herring as well as fresh anchovies with me at all times. Generally, I use fresh herring at Buoy 10 when available. Meanwhile, with the massive tides and current we encounter you should consider brined baits. Brined baits hold up better, last longer and keep you fishing longer. I use Natural Fire Brine most often, but also find success with blue and chartreuse. On the other hand, most of us guides add scents and additives to our brines. We do it to fresh bait, too. Keep in mind, brines don’t have scent in them. With my fresh bait, I like to add a little sea salt and a heavy pitch of brown sugar. It works. 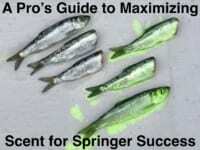 You will find that having quality brined baits is important. The currents are big and you will go through baits fast if not prepared. I like to brine my herring and anchovies the night before in Natural Fire Brine. If I feel they need a bit more toughening up I add sea salt or kosher salt. Another little tip when brining your frozen bait, make sure you thaw them. Doing so enables the brine to keep the scales stay intact better. Some guys don’t want to commit to brining large batches of blue, purple or chartreuse herring, which is where Fire Dye becomes valuable. With Fire Dye you can now color baits on demand. Therefore, if a hot bite ignites on a certain color you can change the bait in five minutes. It’s that simple. To do so, brine all your bait in Natural Fire Brine. 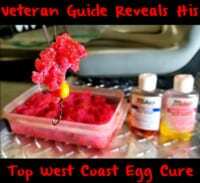 Then bring a few Ziplocs on the boat and if you want to change the natural to blue, red, orange, chartreuse, purple, etc, all you need to do is squirt Fire Dye into the bag and you’ll have the desired color in minutes. Chasing reports can play head games with you. Also, by the time you get there the fish often have moved. Have faith in your program and follow the bait balls. Remember to stay simple. It’s effective. Always, follow the bait. Both work great, but I prefer lead because it’s easier to find the bottom with it. Lead gives flexibility and I think hook to land ratios are a bit better, possibly due to the nature of the bite. With a diver there is resistance till the fish takes it. Nevertheless, using a sliding lead dropper the fish can bite and I believe there is less resistance causing a better hook up. With barbless hooks, every little advantage helps. If I do fish divers, it’s because I’m trying to reduce tangles or fishing a flood tide. On a flood we are fishing higher in the column and when doing so it’s easier to use divers. Lead is more effective when I’m fishing the bottom, which we don’t do on the flood tide. I only reserve the divers on the flood tide. The Buoy 10 fishery can be overwhelming when the wind picks up. Rest assured it will. Ideally, I’m off the water by noon. Afternoon winds can create dangerous conditions. With large ships, sandbars and lots of boats, it’s imperative you always pay attention. For example, when navigating in the fog you need to have a quality charting system to safely navigate around the Desdemona Sands. I’ve seen boats crash into other boats, others stuck in the sand and boats dangerously close to moving ships and barges. Wear your PFDs. In my boat it’s required. You forget the inflatable is even on and in the event something happens you are prepared. 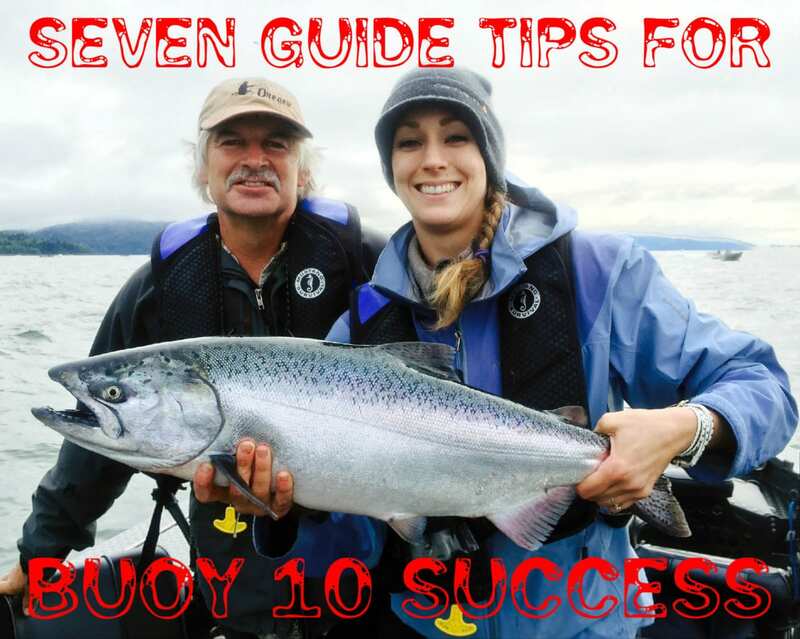 Buoy 10 is the greatest salmon fishery in the Lower 48. It rivals the best Alaska has to offer in terms of a kill fishery and we want to keep it that way. To help do so please release all Tule Chinook. The Tule (Lower Columbia spawning Chinook) is the fish that essentially determines our seasons. They are big, have a bit of color (their bellies might have a red or pink to them), their heads are a bit more mature (hooking of nose, teeth, etc). They also have a smell, even stronger than the salmon. I prefer to even release the hatchery Tule. They don’t eat well anyways. When you cut them open they are pale white and taste bad. Good luck, be safe and good fishing. Editor’s Note: Kyle Buschelman operates Willamette Valley Outfitters. For more information on his Buoy 10 salmon trips please visit https://www.facebook.com/WillametteValleyOutfitters or http://willamettevalleyoutfitters.com.